For several weeks we've been curious about the presence of trucks of various sizes, vans and other strange vehicles on our campus and strange personnel in our building. 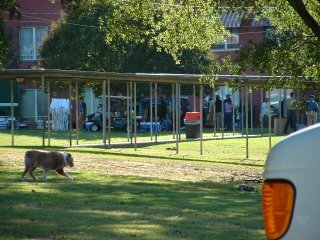 My co-workers and I didn't make the connection with the film "Death Sentence" starring Kevin Bacon being filmed in Columbia. More trucks and equipment showed up with the mother lode arriving on Thursday. By Friday morning there was a full fledge movie shoot going on across from our building. They've turned the second floor of the hospital building where my office is located into an emergency room for the shoot and will be shooting in the boiler room in the basement. (The hospital has been empty except for clinic services for several years.) With my luck everything will be back to normal by Monday when we return to work. The first Raked Leaves sock is finished. I've casted on for the second sock and have completed the toe shaping and started the foot. I'm very pleased with the way these are turning out and they fit mom perfectly. Do you have certain patterns planned for some of the yarns? Do you buy yarn and then choose a pattern? Ocassionally. Most of the time if I see yarn that I like I buy it and figure out what pattern I'm going to use later. Even if I buy yarn with a pattern in mind I usually make something different than the original plan. 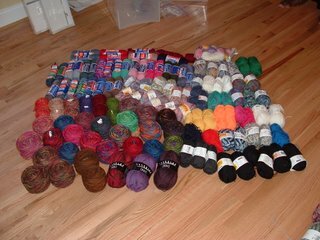 Does a certain sock yarn you have in your stash take you back to a certain event? (where you were when you bought/received it? what was going on in your life at the time!) Absolutely. 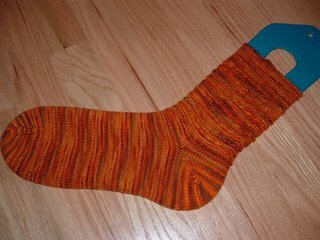 I have some LL Shepherd Sock in Rainbow that I bought at the first machine knitting event I attended. 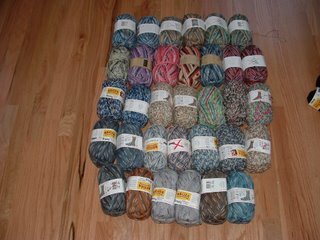 The skeins I have left from the Xmas socks when I didn't know how much to buy. The Regia Clown Color from the modular sweater for my co-workers first and now possibly only child and the list goes on. Socks, socks and more socks!!! But did you or did you not see Kevin?